They might not be considered an essential piece of kit by beginners, and you might even spot the odd professional who doesn’t show much love for the glove, but it may surprise you to learn that the best golf gloves can actually improve your game by quite a long shot. To cut out the jargon, and the possibility of you getting distracted in American Golf and coming away with everything except a glove, we’ve put together what we think are the best options out there. Just to confuse matters (as if a game in which you aim for the lowest score weren’t confusing enough) if you’re right handed, you’ll need a golf glove that goes on your left hand, and if you’re left handed, you’ll need a glove that goes on your right hand. Our best glove all-round is the Under Armour Strikeskin, which offers great grip, comfort and flexibility, all pretty integral to a good game, however it’s left hand only. 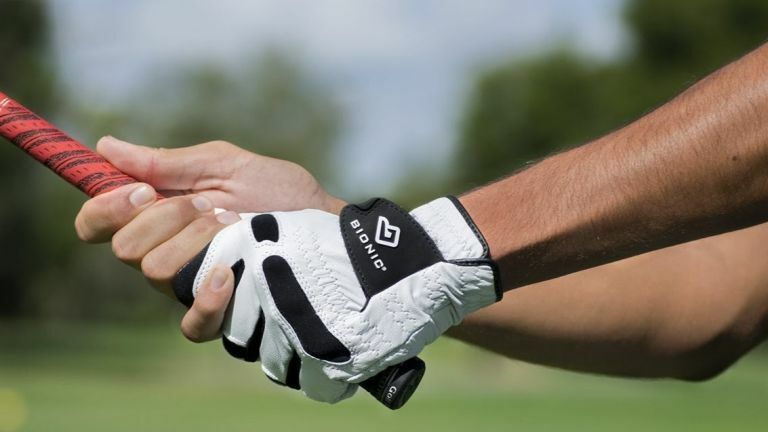 Not that left-handed golfers are an afterthought: the Bionic StableGrip and Zero Friction golf gloves are just a couple of awesome options that suit both sides. If you tend to find yourself between sizes in golf gloves, the adjustable closure tab on these Under Armour Strikeskin gloves is sure to appeal. It’s just one part of a commitment to comfort and excellence that our best golf glove presents, alongside performance leather that offers grip and control over your swing, but stays soft and flexible enough – thanks, we’re told, to the Under Armour fit technology – that you can get properly into your game without being distracted. It’s our best all round. Leather golf gloves might not sound like the most flexible of accessories, but this Mizuno Golf Pro glove puts paid to that idea with its buttery soft cabretta leather and FlexMesh fabric, a synthetic layer across the knuckles that allows you to flex those fingers to your heart’s content while lining up for a swing. Reviewers were all over the enhanced fit and loved the softness of the leather, too, saying the quality of the construction was tangible. When it’s designed by an orthopaedic hand surgeon, you’ve got to admit it’s probably top-drawer, and fans of Bionic’s StableGrip golf glove back up that notion with their high praise. It’s lightweight, it’s comfortable, it’s weatherproof, and it’s constructed to defeat hand fatigue and irritation, with flat seams to keep from rubbing and a well-placed anatomical pad to absorb shock from hitting the ball. Users loved its slim, non-bulky fit too, saying it (please forgive us) fits like a glove. You might already enjoy the benefits of compression sportswear elsewhere on your bod, but did you know you can replicate it for your hands? Zero Friction did, and their compression-fit golf glove is the result of their tinkering, a lightweight synthetic glove that fits close to the hand and doesn’t scratch or rub. Reviewers found it light and flexible, with the synthetic grip patch on the first finger and all-weather palm patch proving especially popular. It also, rather sweetly, comes with a helpful detachable ball and tee marker. Synthetic golf gloves have their advantages, of course, but if you’re a bit of a traditionalist or just prefer the feel of leather, you may want to consider this, the Preferred Glove of TaylorMade pros. It’s made from AAA Cabretta Soft Tech leather, manufactured for incredible softness and flexibility as well as a surprising amount of breathability, and the wrist lining features antimicrobial moisture wicking fabric to whisk away sweat and prevent any sweaty odours. Reviewers loved the quality feel too, so if you’re looking for a treat, this might be it. With a selection of bright colours to choose from, these Callaway gloves are already pretty snappy before you get down to the technicalities. Like our previous pick, they’re leather, and a premium-feeling Optical leather at that, with palm, finger and thumb perforations for extra breathability and moisture reduction. Buyers found that they ran a little small, making them great for petite players, but those who found them a tight fit reported that they stretched out after a few uses, and all agreed they held up well to frequent use.